If you are a Member of Coastal Electric Cooperative in Bryan, Liberty, Long or McIntosh County in coastal Georgia you may notify us of a power outage with our new smartphone app. Search MyCoastal EC in the Apps store or Google Play. Once you install the app you will need your Coastal Electric account number to create your password protected online account. 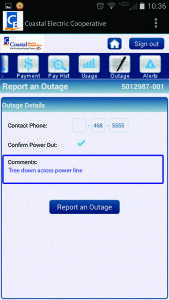 With the Smartphone app you will receive important notifications of power outages affecting your home and notices when power is restored. You can also use the app to make secure bill payments and view a graph of your daily electricity usage. If you don’t want to use the app you can also report your power out from our online portal. If you do not already have an online account you can register here. You may also call us at 1-800-421-2343. If you would like to report a street/security light problem click here.